“We are very proud of our team members who are attending college and are continuing to provide superior customer service to our clients,” said Steve Parker, director of operations at Plain Green. 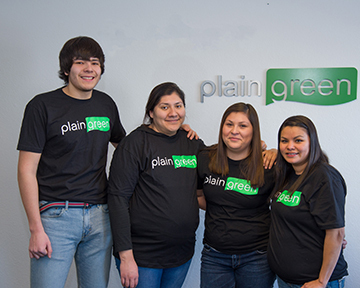 Plain Green, LLC, a wholly-owned business of the Chippewa Cree Tribe, recently recognized five employees who are attending college while working full-time for the company. In support of the company’s commitment to higher education, Plain Green Loans offers full-time employees the opportunity for tuition assistance by paying up to $5,000 per year to help with college tuition, books and fees. Five Plain Green Loans full-time employees who are enrolled in college are Kayla Lodgepole, Sharlene Yellowtail, Savannah Stump, Yesenia Zarco and Porfirio Zarco. Three of the employees were named on the Stone Child College Dean’s list for their academic achievements: Kayla Lodgepole, Sharlene Yellowtail, and Porfirio Zarco. Plain Green, LLC is a wholly-owned business of the Chippewa Cree Tribe. As a tribally-chartered corporation, the primary mission is to maximize the economic and social impact of the Chippewa Cree Tribe and Rocky Boys and Box Elder communities. Knowing the future growth of the community relies on education, the Chippewa Cree community focuses on educational programs and student development for the tribe.